These apps create invisible ads that continually run background on your phone and spend your mobile’s battery much. In addition, they pretend to be iPhone to earn more money. 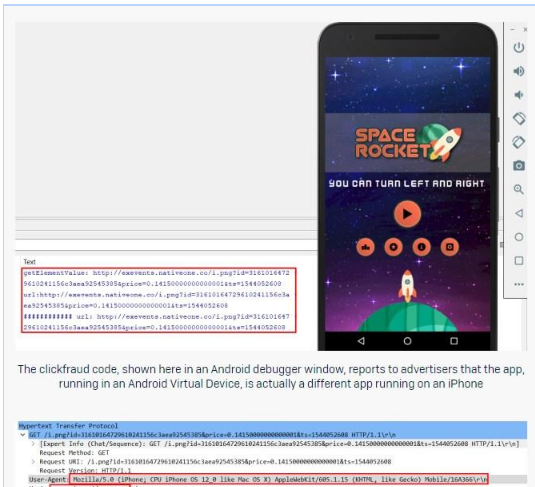 A recent study details how malicious apps were installing malware on our mobile that made it by tweaking user agent string and pretends android phone to be an iPhone and showed invisible advertising continuously even while you are not using your phone. Google has already removed these apps, but if you installed them in their day, they continue to wreak havoc. That in Google Play there are malicious apps is not something that should surprise us. Despite the great work that Google Play Protect does, there are always developers who avoid the increasingly rigorous filters with great skill. The latest discovered malware is known as Andr / Clickr-AD, and we can read all the details in a Sophos report detailing how it worked. It should be noted that the apps that made use of this technique wereeliminated by Google on November 25. In total these 22 apps were installed together by 2 million users. It may seem a small figure if we consider the magnitude of Android users, but it is not less important. These apps stood out for installing malware within our mobile, and simulated clicks on ads. These ads remain invisible to the user, since the developer made them have a size of 0 pixels. With that, they made money without you noticing. The apps invoked these ads even if we had forced the application to close, which caused these apps to have a negative impact on the life of the mobile. Just by having some of these apps your mobile was spending battery, even if you did not use them. The most remarkable thing about this malware is that it makes your mobile pose as an iPhone . The reason for this disguise is that the iPhone ads generally leave more benefit to the developers, precisely because they are an audience that is generally willing to pay more . Although Google Play has decided to delete these apps, the malware that makes developers earn money and you lose battery persists. It’s time to count your mobile and see if you installed some of the apps infected with this malware . We advise your immediate uninstallation. As additional advice, I recommend you take a look at the apps and infected games. Flashlight apps and games with too generic names of any type of subject. If you know any other developer that of this type of profile, it is a symptom to suspect. Know Why you Need CCTV Camera!